Finding the perfect engagement ring is no easy task. You need to find a unique and unforgettable ring that suits the lady as much as your pocket! I visited Victoria Tryon's beautiful studio in St James, London, to ask for her advice. Follow these simple steps and you are guaranteed to find the perfect engagement ring. 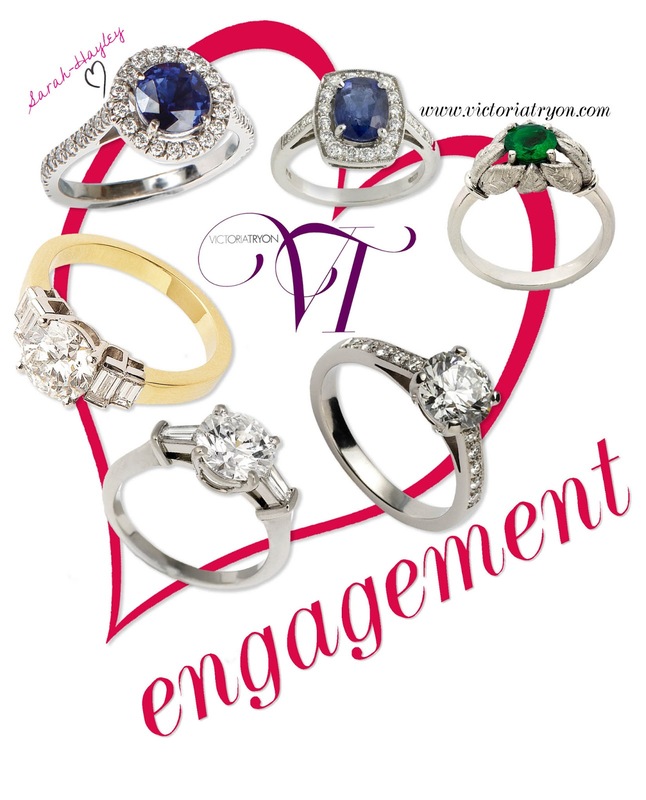 I have featured my favourite rings from Victoria's collection above. BUDGET The most important element is understanding your budget and what the money will buy. Sales Assistants may often convince you that the highest costing ring is the best, this is not always true. BE PERCEPTIVE The options for engagement rings are endless. You have a lot of decisions to make - platinum or gold, delicate or bold . To make these choices easier research a little. Look at the jewellery your partner wears everyday and notice the styles. If there are more pieces in one style, choose that option. INDEPENDENT JEWELER Always consider the independent jeweller, they are highly trained and will have the same experience as their well known competitor, most often they will have began their careers within these establishments. TIME Take your time when choosing this ring, planning ahead is always best. On occasion you will be able to walk out with the perfect ring, but mostly this process takes a few weeks, especially if it is a custom design. If you want to propose at a certain occasion, be sure to plan early. CHOOSE TOGETHER Think about taking your partner with you. Yes the surprise is ruined, but with such an important piece in question, you will not only spend the money wisely, but you are guaranteed to find a true treasured possession! I enjoyed a great afternoon with Victoria and her team. One of the most memorable moments was when I was allowed to handle pretty pink diamonds. You can imagine my excitement! Victoria Tryon also create a beautiful collection of fine jewellery, during my appointment I also enjoyed the opportunity to see and try on various pieces. I am torn between collections 'Once upon a time' and 'Vanity' as my favourites, but it is really difficult to choose. To book a creative consultation with Victoria please click here.